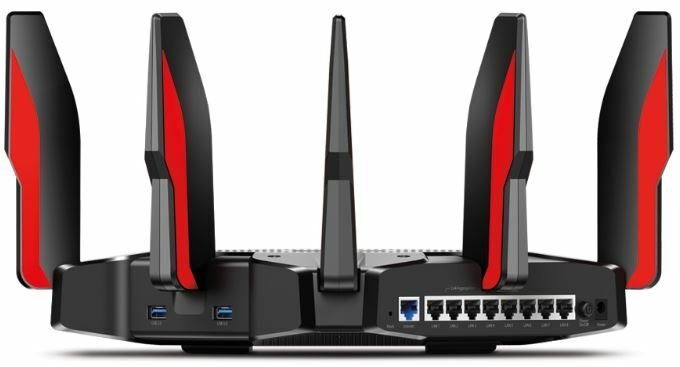 What’s the difference between one router and another? Much of that comes down to you. How many people are going to connect? How much bandwidth are you getting from your ISP? And for choosing a gaming router, what kind of games do you play? It’s by going through these questions that you can find the right router appropriate to your needs. Another good place to start is with one of the major brands. When it comes to developing technology, big brands have some big advantages. Which is part of the reason why, among all people using Wi-Fi in the world, about half of them do so with a TP-Link product. The ubiquitous nature of the brand ensures even the most basic TP-Link router is somewhat formidable. And it allows their higher-end products to become that much more impressive. From an engineering perspective, the TP-Link Archer C5400X is like a sports car. From the in-your-face aesthetic to the hardware inside, everything about the C5400X has been fine-tuned to precision. And it’s this collection of apparently small differences that separate routers like the C5400X from entry-level equipment. The Archer C5400X is powerful. It provides deep support for the latest network standards, impressive internal hardware, and everything you need to connect dozens of devices. It’s also gaming-oriented. That means features which ensure latency is driven down during your matches, and bandwidth is prioritized where you want it to go. Most routers are made to look low-key, discreet, and tucked away out of sight. But gamer-oriented products are rarely that subtle. 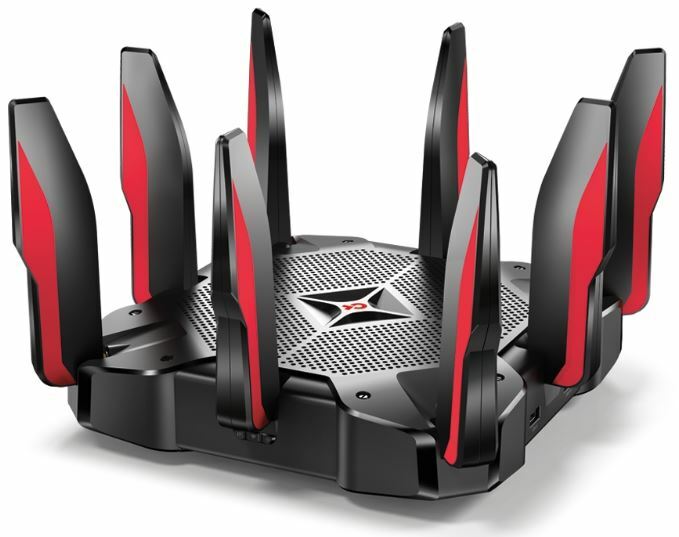 And the TP-Link Archer C5400X Tri Band Gaming Router is unquestionably one of the more distinct looking routers on the market. The base body is actually a fairly simple black rectangle, similar to almost any other router. But sprouting up from each side, you’ll notice a grand total of eight antennas, reaching outward like bladed wings. With those antennas in place, the C5400X measures 9.1 x 9.1 x 1.7-inches, clearly one of the larger routers on the market. The majority of its height is the result of those blades standing upwards, if you’re looking to slide your router into a shelfed area, you may be able to angle the blades downwards and gain an additional inch or two. In addition to its large size, the Archer C5400X Tri Band Gaming Router has a fair amount of heft to it, weighing about 3 pounds. While this isn’t a mesh router, the inclusion of eight antennas does provide virtually the best performance you can get from a single device. The eight antenna design is further aided with a RangeBoost feature, and beamforming with the antennas to send more targeted Wi-Fi signals for devices at greater distances. The gamer-oriented features are reflected in the hardware, inside and out. From a glance at its backside, you can tell the C5400X has twice the number of Gigabit ports as a typical router. 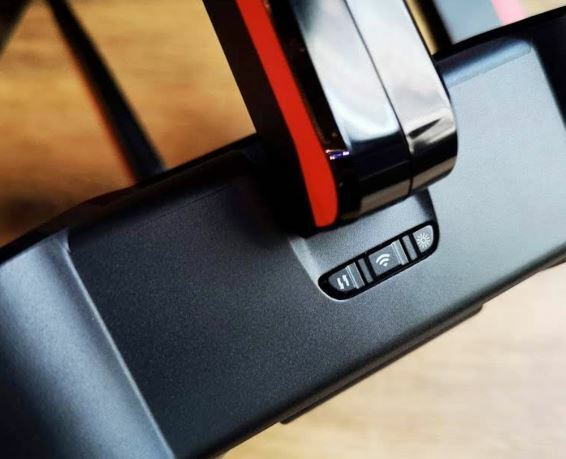 Having a wealth of ports available allows you to plug in all your devices, this allows you to connect everyone and everything, and not have to worry about having space for whatever the next Internet-based gadget you add to your household. These ports also provide the room necessary to double-up your connection, from 1 Gbps to 2 Gbps. 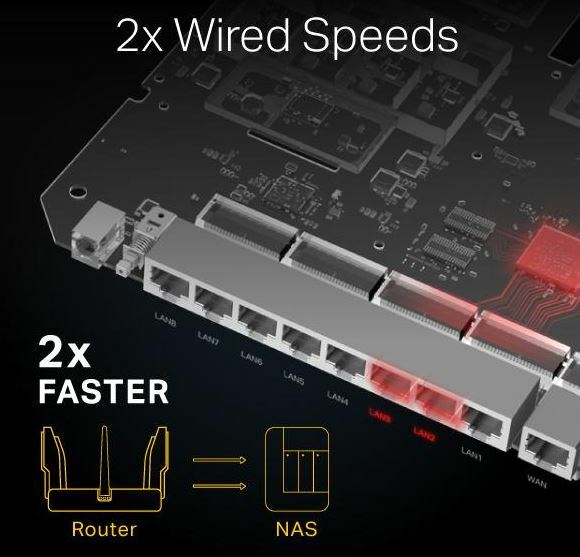 You can use link aggregation, combining two of eight Gigabit Lan ports with one of the WAN/LAN ports to double your connection speed. 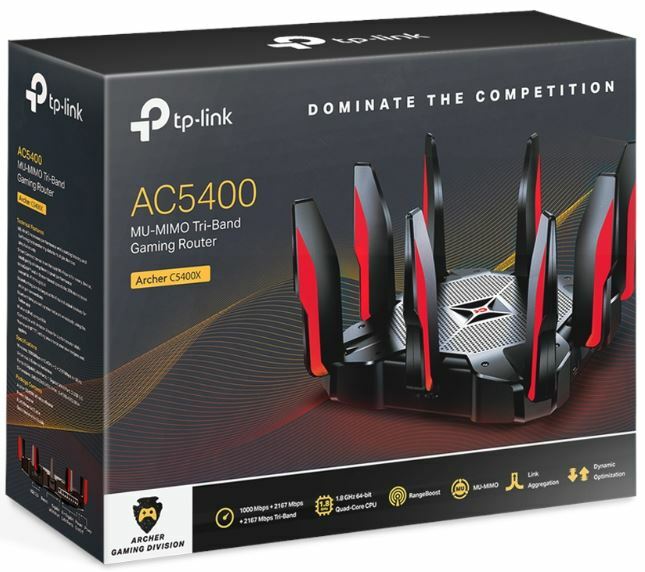 By combining a WAN port and a LAN port with DOCSIS 3.1, the TP-Link Archer C5400X Tri Band Gaming Router can facilitate speeds which are among the best you can buy from any Internet service provider. Each port is clearly labeled, and the Internet port is both labeled and color-coded for ease of use. Apart from that, the rest of the backside of the C5400X is somewhat standard. There’s a power button, DC power port, two USB ports, and a standard reset button. As you might expect, the reset button is recessed within the chassis, so you need a pin to access it. The TP-Link AC5400 Tri Band Gaming Router operates around a 1.8Ghz 64-bit quad core CPU. If you’re not well versed with the importance of processing power in your router, the bottom line is having more power is good for loading speeds. Being able to handle more processes per minute also allows you to take advantage of dynamic optimization, prioritizing traffic more efficiently, and hammering down latency. The 1.8Ghz 64-bit processor is further aided with the help of 3 additional co-processors. Those spare processors are there to manage and moderate Wi-Fi demand across the network. This cooperative process within the hardware helps support smoother gameplay. The TP-Link Archer C540X also offers 1 GB of RAM, a strikingly high amount, which is equally important for network traffic administration. 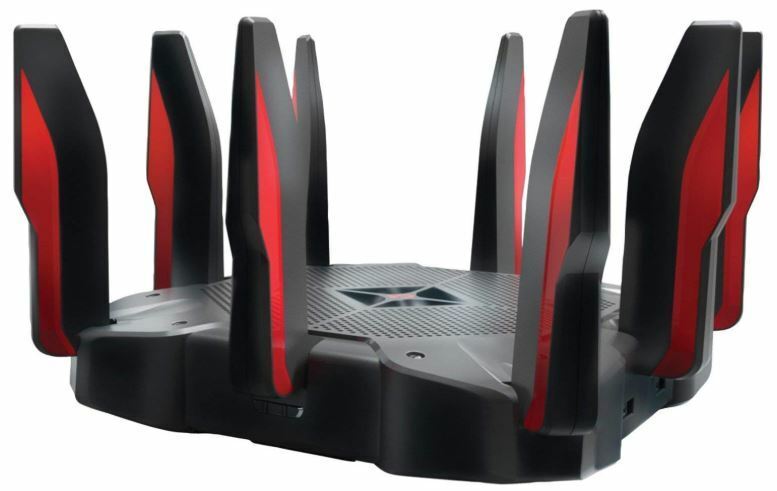 With respect to bandwidth, the AC5400 Tri-Band Gaming Router delivers Wi-Fi in two places. The first is with the help of the 802.11b/g/n 2.4GHz band. The second is with two separate 802.11 ac/n/a 5GHz connections. Those signals are carried with the help of the previously mentioned antennas, providing up to 5,334 Mb per second of total potential bandwidth. You might think of your router as doing everything simultaneously because it works so fast, that’s often what it seems to do. But in reality, ordinary routers are playing a waiting game. The requests passing through their gates are treated in a way that resembles a first-come first-served basis. In other words, the router can only talk to one device at a time. That can be a problem when you’ve got a roommate streaming Netflix in their room, half a dozen mobile phones making regular check-ins, and so on. Which is why top-end routers like the C5400X come equipped with features like MU-MIMO and Airtime Fairness. In short, these features allow for the router to better communicate with itself, resulting in a magnitude of greater efficiency when multiple devices are vying for its attention. Whether you’re a gamer or not, these services can combine for higher throughput capabilities and response rates. Offering three connection bands to work with, you could dedicate one band to gaming while the others are dedicated to other services. 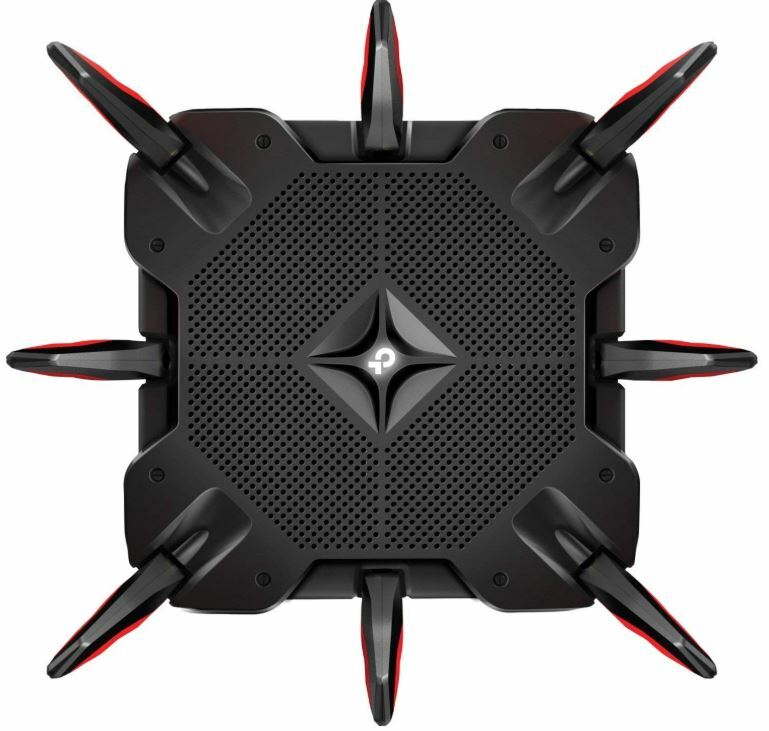 You can even determine how the TP-Link Archer C5400X Tri Band Gaming Router distributes dedicated services to devices on a case by case basis, or based on time of day. Behind any gaming router you’ll find traffic prioritization. And the same is true here. The TP-Link C5400X provides fairly impressive traffic optimization to drive down latency. It allows you to prioritize your games above other types of processes, which can be ideal for competitive gaming. For someone playing first person shooters, latency above roughly 50ms can create concrete performance issues. While those issues are somewhat smaller and more difficult to notice around 50ms, most experienced players will be able to see or experience the difference as it creeps towards 150ms. So when a router like the TP-Link Archer 5400X Tri Band Gaming Router comes along and shaves off 30ms of latency off your gaming, that’s kind of a big deal. In some circumstances, it means you can play on servers you couldn’t have reasonably played on before. If you’re somewhat talented at a game, it will probably mean a small improvement in your play. And if nothing else, it certainly means your gaming experiences will be slightly smoother. But these kinds of benefits aren’t exclusive to games. This type of traffic prioritization can be applied to equal effect with 4K content and video streaming services. It all depends on how you decide to setup your network. For essentially three decades, routers have been getting easier and easier to install. But it’s starting to get difficult to make these things any simpler. The TP-Link Archer C5400X is a good example of this trend in action. It provides support for Bluetooth specifically for the purpose of helping users setup quickly. It’s essentially as simple as pushing a button. As with many feature-rich routers these days, the TP-Link Archer C5400X Tri Band Gaming Router provides you with the ability to create a guest network. But interestingly, you’ve got many choices in how you do so. You could dedicate the 2.4GHZ band, or even both of the 5GHz connections. Again, this provides for circumstantial control of your network. Because TP-Link is an industry giant, they can provide things that you generally only get from bigger companies. For example, the TP-Link C5400X provides wide compatibility with MAC OS, NetWare, UNIX, Linux, and Windows. They also have impressive online support videos, including router setup videos. The information is made pretty accessible for the do-it-yourself crowd, too. The TP-Link Archer C5400X is forward-looking with respect to smart-home compatibility. It provides deep support for Alexa and IFTTT, allowing you to help connect all your smart-home devices together in highly programmable ways. As with any major router manufacturer, TP-Link Home are fairly powerful cyber protection. And that protection continues to become updated without your need to get involved. As new types of threats emerge, your router is learning to block them before the general public even knows they exist. If it wasn’t obvious from looking at the C5400X, there aren’t any compelling mounting options you can use. This router was intended to be set on a flat surface. That aside, the router includes its power supply, one short Ethernet cable, and a quick installation guide. TP-Link also provides a two-year warranty. Who Should Choose the TP-Link Archer C5400X? All in all, the C5400X is a highly sophisticated piece of technology. Whether you’re a gamer or not, this router represents some of the best networking gear money can buy. It’s certainly not the right choice for someone looking for the bare essentials. Just as well, it’s almost certainly the right choice for high-bandwidth households or organizations. Whether or not you appreciate the unique aesthetic, the C5400X has plenty of features that make it easy for gamers to love. Competitive players and streamers will like the performance. And non-gamers don’t have to force bad traffic on their neighbors. In other words, you don’t start getting fragged the moment someone on your network starts a download.